A staff member at a middle school in Nevada was shot and killed while trying to protect children after a student arrived on campus Monday and started opening fire, police say. The shooting occurred at Sparks Middle School in Sparks, Nev.
One male student injured in the shooting has gone through surgery, while the other is doing well, Washoe County School District Chief of Police Mike Mieras said during a news conference. The suspected gunman was also dead, and authorities say no shots were fired by law enforcement. Washoe County Emergency Manager Aaron Kenneston told Reuters that the gunman died of a self-inflicted gunshot wound. A Sparks police dispatcher said reports of the shooting — which happened on the school’s campus, but outside the school building itself — started coming in at 7:16 a.m. local time. Police said between 150 and 200 officers responded to the shooting. Kyle Nucum, a 13-year-old student, told the Reno Gazette-Journal that he saw a classmate shoot a teacher. Authorities believe the staff member was trying to protect students when he was killed. 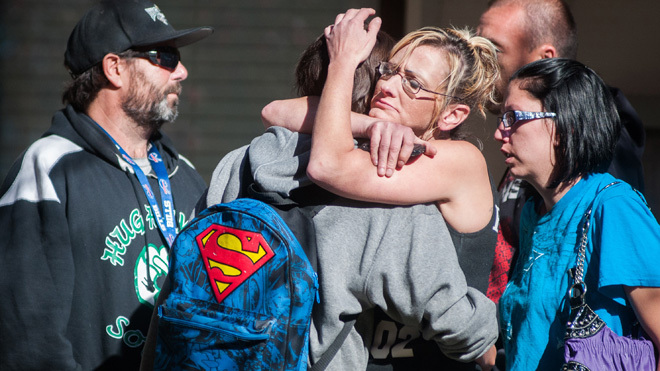 “My estimation is that he is a hero,” said Reno Police Department Deputy Chief Tom Robinson. Police said there is no apparent motive yet for the shooting and they believe the gunman acted alone. The area is now secure, but Sparks Middle School will remain closed for the rest of the week. 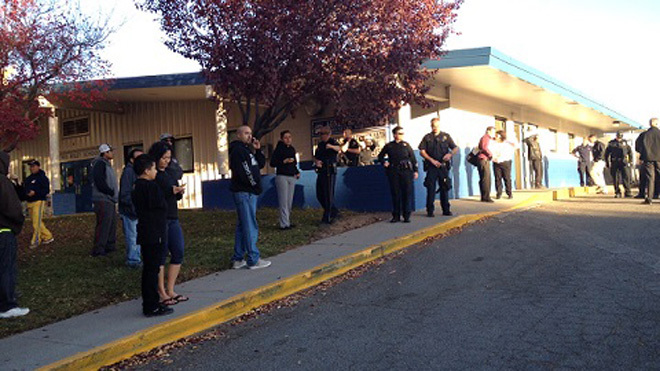 Washoe County School District spokesman Charles Rahn told the Associated Press that the middle school and the adjacent Agnes Risley Elementary School were evacuated to Sparks High School. Rahn said the elementary school will stay closed Monday. At the evacuation center, parents walked with their arms around their children, some of whom were in tears. “My administration is receiving regular updates and the Nevada Highway Patrol is assisting at the scene,” he added. “No words of condolence could possibly ease the pain, but I hope it is some small comfort that Nevada mourns with them. I stand by to be of any assistance if there is anything that can be done,” Reid said in a statement. The school, which enrolls about 700 students in 7th and 8th grades, has a strict uniform policy that forbids the colors red and blue in students’ outfits, colors commonly associated with rival gangs. Sparks, a city of roughly 90,000, lies just east of Reno.